The simultaneous imaging and manipulating of neural activity could enable the functional dissection of neural circuits. Here we have combined two-photon optogenetics with simultaneous volumetric two-photon calcium imaging to measure and manipulate neural activity in mouse neocortex in vivo in three-dimensions (3D) with cellular resolution. 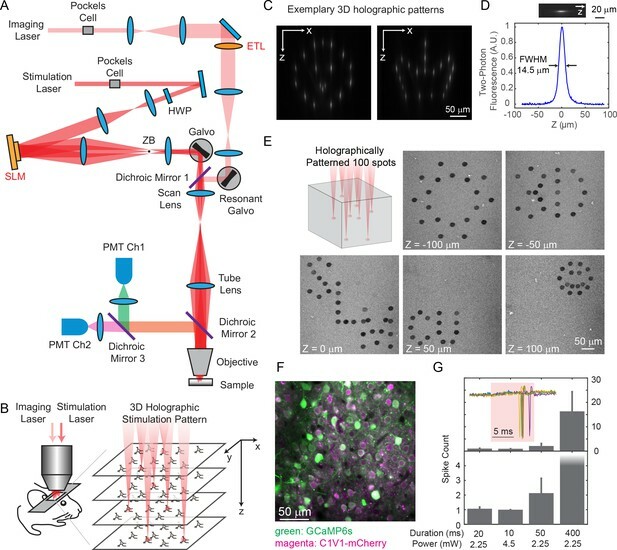 Using a hybrid holographic approach, we simultaneously photostimulate more than 80 neurons over 150 μm in depth in layer 2/3 of the mouse visual cortex, while simultaneously imaging the activity of the surrounding neurons. We validate the usefulness of the method by photoactivating in 3D selected groups of interneurons, suppressing the response of nearby pyramidal neurons to visual stimuli in awake animals. Our all-optical approach could be used as a general platform to read and write neuronal activity. Modern microscopy provides a window into the brain. The first light microscopes were able to magnify cells only in thin slices of tissue. By contrast, today’s light microscopes can image cells below the surface of the brain of a living animal. Even so, this remains challenging for several reasons. One is that the brain is three-dimensional. Another is that brain tissue scatters light. Trying to view neurons deep within the brain is a little like trying to view them through a glass of milk. Most of the light scatters on its way through the tissue with the result that little of the light reaches the target neurons. Yang et al. have now tackled these challenges using a technique called holography. Holography produces 3D images of objects by splitting a beam of light and then recombining the beams in a specific way. Yang et al. applied this technique to an infrared laser beam, opting for infrared because it scatters much less in brain tissue than visible light. Directing each of the infrared beams to a different neuron can produce 3D images of multiple cells within the brain’s outer layer, the cortex, all at the same time. The holographic infrared microscope can be used alongside two techniques called optogenetics and calcium imaging, in which light-sensitive proteins are inserted into neurons. Depending on the proteins introduced, shining light onto the neurons will either change their activity, or cause them to fluoresce whenever they are active. Just as a computer can both “read” and “write” data, the holographic microscope can thus read out existing neuronal activity or write new patterns of activity. By combining these techniques, Yang et al. were able to stimulate more than 80 neurons at the same time – and meanwhile visualize the activity of the surrounding neurons – at multiple depths within the mouse cortex. This new microscopy technique, while a clear advance over existing methods, still cannot image and control neurons throughout the entire cortex. The next goal is to further extend this method across multiple brain areas and manipulate the activity of any subset of neurons at will. Neuroscientists will greatly benefit from the ability to image and alter the activity of living neural circuits in 3D. In the future, clinicians may be able to use this technique to treat brain disorders by adjusting the activity of abnormal neural circuits. The precise monitoring and control of neuronal activity may be an invaluable tool to decipher the function of neuronal circuits. For reading out neuronal activity in vivo, the combination of calcium imaging of neuronal populations (Yuste and Katz, 1991) with two-photon microscopy (Denk et al., 1990), has proved its utility because of its high selectivity, good signal-to-noise ratio, and depth penetration in scattering tissues (Yuste and Denk, 1995; Cossart et al., 2003; Zipfel et al., 2003; Helmchen and Denk, 2005; Svoboda and Yasuda, 2006; Ji et al., 2016; Yang and Yuste, 2017). Moreover, two-photon imaging can be combined with two-photon optochemistry (Nikolenko et al., 2007; Dal Maschio et al., 2010) or two-photon optogenetics (Packer et al., 2012; Rickgauer et al., 2014; Packer et al., 2015; Emiliani et al., 2015; Carrillo-Reid et al., 2016) to allow simultaneous readout and manipulation of neural activity with cellular resolution. But so far, the combinations of these optical methods into an all-optical approach have been largely restricted to two-dimensional (2D) planes (Nikolenko et al., 2007; Dal Maschio et al., 2010; Rickgauer et al., 2014; Packer et al., 2015; Carrillo-Reid et al., 2016). At the same time, neural circuits are three dimensional, and neuronal sub-populations are distributed throughout their volume. Therefore, extending these methods to three dimensions (3D) appears essential to enable systematic studies of microcircuit computation and processing. Here we employed wavefront shaping strategies with a customized dual-beam two-photon microscope to simultaneously perform volumetric calcium imaging and 3D patterned photostimulations in mouse cortex in vivo. For phostostimulation, we adopted a hybrid strategy that combines 3D holograms and galvanometer driven spiral scans. Furthermore, we used a pulse-amplified low-repetition-rate (200 kHz ~ 1 MHz) laser, which significantly reduces the average laser power required for photoactivation, and minimizes thermal effects and imaging artifacts. With this system, we photostimulated large groups of cells simultaneously in layer 2/3 of primary visual cortex (V1) in awake mice (>80 cells distributed within a 480 × 480 × 150 μm3 imaged volume), while simultaneously imaging the activity of the surrounding neurons. Compared with other 3D all-optical approaches (Dal Maschio et al., 2017; Mardinly et al., 2017), which used scanless holographic photostimulation, our hybrid approach requires less laser power to stimulate per cell, and can thus simultaneously photostimulate more cells for a given fixed power budget. This all-optical method is useful to analyze the function of neural circuits in 3D, such as studying cell connectivity, ensemble organization, information processing, or excitatory and inhibitory balance. As a demonstration, we photostimulated groups of pyramidal cells in 3D with high specificity, and also targeted a selective population of interneurons in V1 in awake mice, finding that stimulating the interneurons reduced the response of pyramidal cells to visual simuli. We built a holographic microscope with two independent two-photon lasers, one for imaging and the other for photostimulation (Figure 1A). Each laser beam’s axial focal depth could be controlled without mechanical motion of the objective, yielding maximum flexibility while reducing perturbations to the animal. On the imaging path, we coupled a wavelength-tunable Ti:Sapphire laser through an electrically tunable lens (ETL, EL-10-30-C-NIR-LD-MV, Optotune AG) (Grewe et al., 2011) followed by a resonant scanner for high speed volumetric imaging. The ETL, as configured, provided an adjustable axial focus shift up to 90 μm below and 200 μm above the objective’s nominal focal plane. On the photostimulation path, we used a low-repetition-rate ultrafast laser coupled to a spatial light modulator (SLM, HSP512-1064, Meadowlark Optics) to shape the wavefront, allowing flexible 3D beam splitting that simultaneously targets the user defined positions in the sample (Figure 1B–1E). The axial and lateral targeting error was 0.59 ± 0.54 μm and 0.82 ± 0.65 μm, respectively, across a 3D field of view (FOV) of 240 × 240 × 300 μm3 (Figure 1—figure supplement 1; Materials and Methods). The SLM path was coupled through a pair of standard galvanometers that can allow for fast extension of the targeting FOV beyond that nominal addressable SLM-only range (Yang et al., 2015). For optogenetics experiments, we actuated this pair of galvanometric mirrors to scan the beamlets in a spiral over the cell bodies of the targeted neuron (see Figure 1E for an exemplary 3D pattern with 100 targets on an autofluorescent plastic slide). We term this a ‘hybrid’ approach, as it combined holography with mechanical scanning, as opposed to purely holographic approach. For in vivo experiments, we imaged green fluorescence from the genetically encoded calcium indicator GCaMP6s or GCaMP6f (Chen et al., 2013) and photostimulated a red-shifted opsin, C1V1-mCherry (Yizhar et al., 2011). With switchable kinematic mirrors and dichroic mirrors, the lasers could be easily redirected to whichever path, and thus the system could also be utilized for red fluorophores and blue opsins. Two-photon imaging and photostimulation microscope. (A) Dual two-photon excitation microscope setup. HWP, half-wave plate; ZB, zeroth-order beam block; SLM, spatial light modulator; ETL, electrically tunable lens; PMT, photomultiplier tube. (B) Schematics for simultaneous volumetric calcium imaging and 3D holographic patterned photostimulation in mouse cortex. (C) Exemplary 3D holographic patterns projected into Alexa 568 fluorescence liquid with its xz cross section captured by a camera. (D) Measured point spread function (PSF) in the axial (z) direction for two-photon excitation (photostimulation path). The full-width-at-half-maximum (FWHM) is 14.5 μm, corresponding to an NA ~ 0.35. (E) 100 spots holographic pattern spirally scanned by a post-SLM galvanometric mirror bleaching an autofluorescence plastic slide across five different planes. (F) A typical field of view showing neurons co-expressing GCaMP6s (green) and C1V1-mCherry (magenta). (G) Spike counts of target pyramidal cells in layer 2/3 of mouse V1 evoked by photostimulation with different spiral duration and average laser power (3 cells in each condition; mice anesthetized; 1 MHz repetition rate for photostimulation laser). The inset shows the cell-attached recording of a 10 ms spiral stimulation over five trials in a neuron. The red shaded area indicates photostimulation period. Error bars are standard error of the mean over cells. We co-expressed GCaMP6s or GCaMP6f (Chen et al., 2013) and C1V1-p2A (Yizhar et al., 2011) in mouse V1 (Figure 1F), and excited them with 940 nm and 1040 nm light, respectively. The separation of their excitation spectrum allowed for minimal cross-talk between the imaging and photostimulation paths (Discussion). C1V1-expressed cells were identified through a co-expressed mCherry fluorophore. Single spikes can be evoked with very low average laser power (~2.25 mW with 20 ms spiral, or ~ 4.5 mW with 10 ms spiral, 1 MHz pulse train, layer 2/3 in vivo, Figure 1G), latency and jitter (17.0 ± 4.2/8.5 ± 1.6 ms latency, and 2.0±1.5/0.5±0.3 ms jitter for the two conditions, Figure 1—figure supplement 2; jitter defined as the standard deviation of the latency). With a higher power (10 ~ 20 mW), neural activity could also be evoked with photostimulation duration as short as 1 ms (Figure 2). Comparison between spiral scan and scanless holographic approaches for photostimulation. In the scanning approach, the laser spot is spirally scanned over the cell body; in the scanless approach, a disk pattern (~12 μm in diameter) is generated by the SLM, covering the entire cell body at once. (A) Photostimulation triggered calcium response of a targeted neuron in vivo at mouse layer 2/3 of V1, for different stimulation modalities. For each modality, the multiplication of stimulation duration and the power squared was kept constant over four different stimulation durations. The average response traces are plotted over those from the individual trials. (B) ΔF/F response of neurons on different photostimulation conditions [10 cells over two mice in vivo (photostimulated one at a time), layer 2/3 of V1, over a depth of 100 ~ 270 μm from pial surface; one-way ANOVA test show significant different response between spiral scan and scanless approach at the same power for stimulation duration of 20 ms, 10 ms and 5 ms. At 1 ms, the p value is 0.17]. For each neuron and each stimulation duration, the power used in the scanless disk modality is 1 and 1.8 times relative to that in the spiral scan. For each neuron and each modality, the multiplication of the stimulation duration and the power squared was kept constant over four different stimulation durations. The power used in the spiral scan with 20 ms duration varies from 2.2 mW to 5 mW for different cells. (C) Boxplot summarizing the statistics in (B). The central mark indicates the median, and the bottom and top edges of the box indicate the 25th and 75th percentiles, respectively. The whiskers extend to the most extreme data points (99.3% coverage if the data are normal distributed) not considered outliers, and the outliers are plotted individually using the '+' symbol. In this experiment, the mice are transfected with GCaMP6f and C1V1-mCherry. Repetition rate of the photostimulation laser is 1 MHz. The spiral scan consists of 50 rotations with progressively shrinking radius, and the scanning speed is adjusted to make different stimulation durations. Compared with alternative scanless strategy like temporal focusing (Rickgauer et al., 2014; Mardinly et al., 2017; Hernandez et al., 2016; Pégard et al., 2017) or pure holographic approaches (Dal Maschio et al., 2017), where the laser power is distributed across the whole cell body of each targeted neuron, our hybrid approach is simple, accommodates large numbers of simultaneous targets, and appears to have a better power budget for large population photostimulation in general. To test this, we compared the required power budget for hybrid approach and the scanless (pure holographic) approach at different photostimulation durations (20 ms, 10 ms, 5 ms and 1 ms). On our system, when photostimulation duration was above 5 ms, the hybrid approach required about half of the laser power than the scanless approach to evoke similar response in the neuron; at 1 ms photostimulation duration, the hybrid approach shows a trend with smaller power budget (but not significant, p=0.17 using one-way ANOVA test) than the scanless approach (Figure 2, Figure 2—figure supplement 1). One reason for this difference is that the scanless approach employs a spatial multiplexed strategy, where the two-photon light is spatially distributed across the entire cell body; to maintain the two-photon excitation efficiency (squared-intensity) within its coverage area, a larger total power is typically required. The hybrid approach, on the other hand, is a combination of spatial (across different cells) and temporal (within individual cell) multiplexed strategy. While optimal strategy will depend on opsin photophysics, the opsin typically has a long opsin decay constant (Mattis et al., 2011) (10 s of millisecond) and this favors the hybrid approach because the opsin channels can stay open during the entire (multiple) spiral scans. But at very short duration, the limited number of laser pulses per unit area may contribute to an efficiency drop of the hybrid approach versus scanless approach. We tested our 3D all-optical system by targeting and photoactivating selected groups of pyramidal cells throughout three axial depths of layer 2/3 of V1 in anesthetized mice, while simultaneously monitoring neuronal activity in those three planes (240 × 240 μm2 FOV for each plane) at 6.67 vol/s. Neurons were photoactivated one at a time (Figure 3—figure supplement 1), or as groups/ensembles (M neurons simultaneously, M = 3 ~ 27, Figure 3) and the majority of the targeted cells (86 ± 6%, Materials and Methods) showed clear calcium transients in response to the photostimulation (Figure 3C–E). Simultaneous holographic photostimulation of pyramidal cells in vivo. (A) Contour maps showing the spatial location of the cells in three individual planes in mouse V1 (145 μm, 195 μm, and 245 μm from pial surface). Cells with shaded color are the targeted cells. (B) 2D overlap projection of the three planes in (A). (C)-(E) Representative photostimulation triggered calcium response of the targeted cells (indicated with red shaded background) and non-targeted cells, for different stimulation patterns. A total number of (C) 3, (D) 9, and (E) 27 cells across three planes were simultaneously photostimulated. The average response traces are plotted over those from the individual trials. (F) Histogram of individual targeted cell response rate (averaged across trials) in different stimulation conditions. The stimulation conditions are listed in (H). (G) Histogram of the percentage of responsive cells in a targeted ensemble across all trials in different stimulation conditions. (H) Response of the non-targeted cells to the photostimulation versus distance to their nearest targeted cell. ΔF/F is normalized to the averaged response of the targeted cells. The total number of photostimulation patterns for condition 1 ~ 7 in (F~H) is 34, 26, 12, 8, 6, 2, 1 respectively; and the total trial for each condition is 8 ~ 11. The mice were transfected with GCaMP6s and C1V1-mCherry. The photostimulation power is 4 ~ 5 mW/cell, and duration was 870 ms, 962 ms, and 480 ms for conditions 1, 2, and 3 ~ 7 respectively. We further investigated the reliability of the photoactivation and also its influence on the activation of non-targeted cells – that is, cells within the FOV not explicitly targeted with a beamlet. We performed 8 ~ 11 trials for each stimulation pattern. Cells not responding to photostimulation under any condition were excluded in this analysis (see Materials and Methods). We characterize the response rate at the individual cell (Figure 3F) and the ensemble level (Figure 3G). 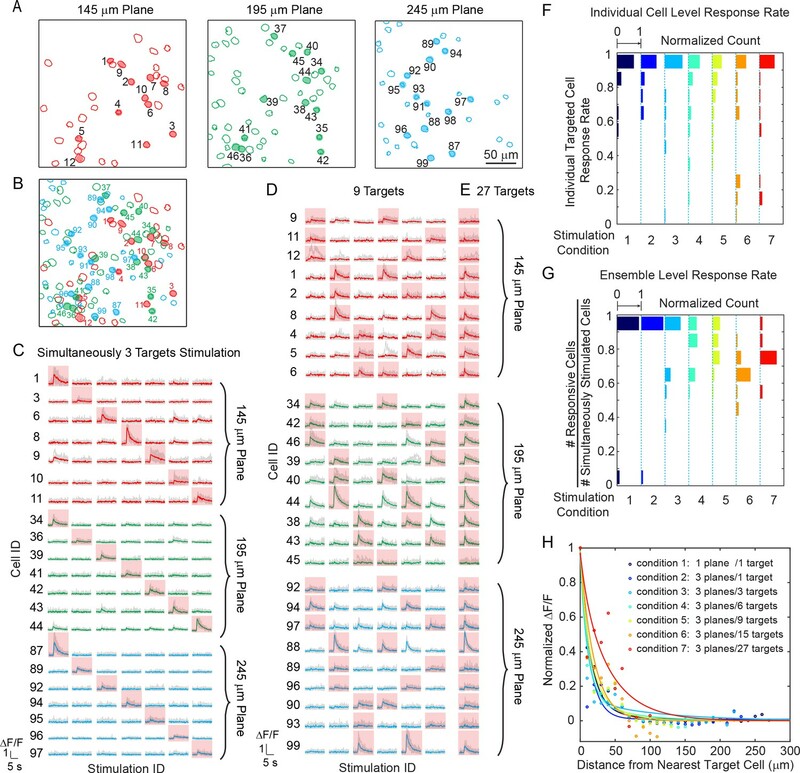 The former characterizes the response rate of individual targeted cells in any stimulation pattern, and the latter characterizes the percentage of responsive cells within a targeted ensemble (defined here as ensemble response rate). 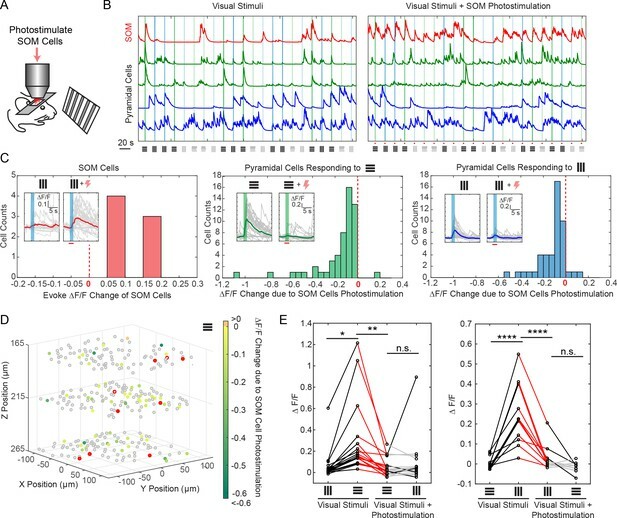 As the simulatenously stimulated neurons number M increased, the response rate for both individual cells and ensembles remained high (both is 82 ± 9%, over all seven stimulation conditions). Although we had high targeting accuracy and reliability for exciting targeted cells, we also observed occasional activity in non-targeted cells (nonspecific activation) during photostimulation (Figure 3H). This was distance-dependent, and as the distance d between the non-targeted cells and their nearest targeted cells decreased, their probability of activation increased (Figure 3H). And, for the same d, this probability increased with M. The activation of the non-targeted cells may occur through different mechanisms, such as by direct stimulation (depolarization) of the cells through their neurites that course through the photostimulation region, or through synaptic activation by targeted cells, or by a combination of the two. In these experiments, we specifically used extremely long stimulation durations (480 ~ 962 ms) to maximally emulate an undesirable photostimulation scenario. The nonspecific activation was confined (half response rate) within d < 25 μm in all conditions (M = 3 ~ 27 across three planes spanning a volume of 240 × 240 × 100 μm3). Nonspecific activation could be reduced by increasing excitation NA (which is currently limited by the relatively small size of the activation galvanometer mirrors), using somatic-restricted expression (Pégard et al., 2017; Baker et al., 2016; Shemesh et al., 2017), as well as sparse expression. We then aimed to modulate relatively large groups of neurons in 3D. With the low-repetition-rate laser and hybrid scanning strategy (Discussion), the laser beam can be heavily spatially multiplexed to address a large amount of cells while maintaining a low average power. We performed photostimulation of 83 cells across an imaged volume of 480 × 480×150 μm3 in layer 2/3 of V1 in awake mice (Figure 4). With a total power of 300 mW and an activation time of ~ 95 ms, we were able to activate more than 50 cells. In one experiment, we further sorted target cells into two groups (40 and 43 cells respectively) and photostimulated them separately. More than 30 cells in each group were successfully activated simultaneously with clear evoked calcium transient. In another example, more than 35 cells out of a target group of 50 cells responded (Figure 4—figure supplement 1). These large scale photostimulations (>=40 target cells; Figure 4), show that 78 ± 7% of cells in the target ensemble can be successfully activated (excluding cells that never respond in any of the tested photostimulation pattern, 8 ± 3%, see Materials and Methods). Nonspecific photoactivation was more frequent for cells surrounded by target cells, but overall it was confined within 20 μm from the nearest target cell (Figure 4F). We also noted that cells that could be photoactivated individually or in a small ensemble may not get photoactivated when the number of target neurons increases. We hypothesize that this could be due to feed forward inhibition, as targeted pyramidal neurons may activate local interneurons, which then could suppress the firing of neighboring cells. These network interactions will be the subject of future study. Large scale photostimulation of pyramidal cells in layer 2/3 of V1 in awake mice. (A~C) Simultaneous photostimulation of 40 cells, 43 cells and 83 cells across four planes in mouse V1 (150 μm, 200 μm, 250 μm and 300 μm from pial surface, with an imaged FOV of 480 × 480 µm2 in each plane.). The contour maps show the spatial location of the cells in individual planes. Cells with black contour are the simultaneously targeted cells. The red shaded color shows the evoked ΔF/F in average. (D) Photostimulation triggered calcium response of the targeted cells (indicated with red shaded background) and non-targeted cells, corresponding to conditions shown in (A~C). The average response traces are plotted over those from a total of 11 individual trials. Those with a red dot indicate cells showing clear evoked calcium transient through manual inspection. (E) Number of target cells, number of total responsive cells across all trials, and cells that did not show any response in any photostimulation pattern, for four different photostimulation conditions. Condition 1 ~ 3 correspond to those in (A~C). Error bars are standard deviation over trials. (F) Response of the non-targeted cells to the photostimulation versus distance to their nearest targeted cell (for conditions shown in E). ΔF/F is normalized to the averaged response of the targeted cells. Error bars are standard error of the mean over different photostimulation conditions in (E). The mice were transfected with GCaMP6f and C1V1-mCherry. The photostimulation power was 3.6 ~ 4.8 mW/cell, and the duration was 94 ms (composing of 5 continuously repeated spiral scans). Nonspecific excitation can be minimized with sparse stimulation, by simply reducing the likelihood of stimulating directly adjacent cells. One naturally sparse pool of cells are cortical interneurons. Different interneuron classes participate in cortical microcircuits that could serve as gateways for information processing (Muñoz et al., 2017; Karnani et al., 2014). These interneurons are located sparsely in the cortex, yet are highly connected to excitatory populations (Fino and Yuste, 2011), and are known to strongly modulate cortical activity (Tsumoto et al., 1979). However, the effect of simultaneous stimulation of selective subset of interneurons with single cell resolution has not been studied in detail, as previous reports have largely relied on one-photon optogenetics where widespread activation is the norm (Lee et al., 2012; Wilson et al., 2012) [but see Ref. (Karnani et al., 2016) for single cell interneuron stimulations]. To explore this, we used our all-optical approach to examine the effect of photoactivating specific sets of interneurons in 3D on the activity of pyramidal cells that responded to visual stimuli in awake head-fixed mice (Figure 5). Selective photostimulation of SOM interneurons suppresses visual response of pyramidal cells in awake mice. (A) Experiment paradigm where the SOM cells were photostimulated when the mouse received drifting grating visual stimulation. (B) Normalized calcium traces (ΔF/F) of representative targeted SOM cells and pyramidal cells that are responding to visual stimuli, without (left panel) and with (right panel) SOM cell photostimulation. The normalization factor of the ΔF/F trace for each cell stays the same across the two conditions. The shaded regions indicate the visual stimuli period. The symbols at the bottom of the graph indicate the orientations and contrast of the drifting grating (black, 100% contrast; gray, 10% contrast). (C) Histogram of the visual stimuli evoked ΔF/F change for different cell populations that show significant activity change (p<0.05, two-sample t-test over ~ 30 trials) due to SOM cell photostimulation (M = 9, simultaneously photostimulated). Left panel, targeted SOM cells (7 out of 9 show significant responses to photostimulation). Middle and right panels, pyramidal cells responding to horizontal or vertical drifting-gratings respectively. The inset compares the activity of a representative cell without and with targeted SOM cell photostimulation; the shaded regions indicate the visual stimuli period; the red bar indicates the photostimulation period. (D) Spatial map of all recorded cells. Pyramidal cells responding to horizontal drifting-gratings and showing significant visual stimuli evoked ΔF/F change due to SOM cell photostimulation (p<0.05, two-sample t-test over ~30 trials) [cell population in the middle panel of C] are color coded according to their ΔF/F change. The targeted SOM cells are outlined in red, and those responding are shaded in red. (E) Comparison of the orientation selectivity in normal situation and with SOM cells photostimulation, for a cell population that normally have strong orientation selectivity but responsive to SOM cells photostimulation. During SOM cell photostimulation, their selectivity is largely abolished (one-way ANOVA test). For individual cells, black and red lines indicate a significant difference in the visual stimuli evoked ΔF/F between the two conditions that the lines connect with (~30 trials, p<0.05, two-sample t-test), whereas gray lines indicate no significant difference. The SOM-cre mice were transfected with GCaMP6s and Cre-dependent C1V1-mCherry. The duration of visual stimuli was 2 s. The photostimulation power was ~ 6 mW/cell, and the duration was 2.8 s (composing of 175 continuously repeated spiral scans). Using viral vectors, we expressed Cre-dependent C1V1 in somatostatin (SOM) inhibitory interneurons (SOM-Cre mice), while simultaneously also expressing GCaMP6s in both pyramidal cells and interneurons, in layer 2/3 of mouse V1. We first imaged the responses of pyramidal cells across three planes (separated by ~ 45 μm each) to orthogonal visual stimuli consisting of drifting grating without photostimulation. We then simultaneously photostimulated a group of SOM cells (M = 9, with seven showing responses) across these three planes concurrently with the visual stimuli (Figure 5A–C; Materials and Methods). We observed a significant suppression (p<0.05, two-sample t-test) in response among 46% and 35% of the pyramidal cells that originally responded strongly to the horizontal and vertical drifting-grating respectively (Figure 5A–E). Moreover, the orientation selectivity of highly selective cells was largely abolished by SOM cell photoactivation (Figure 5E). This is consistent with reports that SOM cells inhibit nearby pyramidal cells with one-photon optogenetics in vivo (Lee et al., 2012; Wilson et al., 2012) or with two-photon glutamate uncaging in vitro (Fino and Yuste, 2011). Our two-photon approach provides high precision 3D manipulation over groups of cells (Figure 5D), and simultaneous readout of neuronal activity across the network in vivo. Thus, our approach could be useful for dissecting the excitatory and inhibitory interactions in cortical circuits in vivo. We describe here a 3D all-optical method that could be used to map the functional connectivity of neural circuits and probe the causal relationships between the activity of neuronal ensembles and behavior. We extend previous in vivo methods from planar to volumetric targeting, and increase the total number of cells that could be simultaneously photoactivated. This represents a significant advance of precision optogenetics towards large spatial scales and volumes. The dual beam path microscope facilitates independent control of imaging and photostimulation lasers, and is thus well suited for controlling and detecting neural activity, without any disturbing or slow movements of the objective. In the following sections we discuss our rationale for the design of the microscope and evaluate the results. To simultaneously photostimulate multiple cells with two-photon excitation, it is becoming common to use holographic approaches (Nikolenko et al., 2008; Packer et al., 2012; Packer et al., 2015; Dal Maschio et al., 2017; Mardinly et al., 2017; Pégard et al., 2017). Spatial light modulators can generate an ‘arbitrary’ 3D pattern on the sample, limited only by Maxwell’s equations, and the space-bandwidth product of the modulation device. With SLMs, one can independently target a very large number of sites, far in excess of what we demonstrate here, but the number of addressable neurons is limited by the allowable power budget. Moreover, special care has to be taken to minimize the total power deposited on the brain, and avoid direct and indirect thermal effects (Podgorski and Ranganathan, 2016). We addressed this issue by using a hybrid holographic strategy and a low-repetition-rate laser for photostimulation, with high peak intensities for efficient two-photon excitation, but moderate average power. This allowed us to target a large group of cells with low average power (e.g. 83 targeted cells across an imaged volume of 480 × 480 × 150 μm3 in awake mice V1 layer 2/3 with 300 mW in total, Figure 4). As these cells generally are not targeted continuously, we do not expect any heat induced effects on cell health under our stimulation conditions (Podgorski and Ranganathan, 2016). In our hybrid strategy, a group of beamlets is generated by the SLM that target the centroids of the desired neurons. Each discrete focal point in the hologram maintains sufficient axial confinement for typical inter-cell spacing. These beamlets are then rapidly spirally scanned over the neurons’ cell bodies by post-SLM galvanometers. Several alternative scanless approaches exist: pure 3D holograms and another method combining holographic patterning and temporal focusing. The former approach directly generates the full 3D hologram covering the cell bodies of targeted neurons all at once (Dal Maschio et al., 2017). Though simplest, the full 3D hologram has a decreased axial resolution as its lateral extend increases (Papagiakoumou et al., 2008), and is subject to light contamination to the non-targeted cells, particularly in scattering tissues such as the mammalian brain. In contrast, temporal focusing (Oron et al., 2005; Zhu et al., 2005) decouples axial from lateral extent of the hologram by coupling the holographic pattern to a grating (Papagiakoumou et al., 2008) such that only one axial position in the sample has sufficient spectral content to generate a short laser pulse, thus tightening the axial confinement. Recent reports have extended this method to 3D stimulation(Hernandez et al., 2016;Pégard et al., 2017;Accanto et al., 2017). Regardless of the exact implementation, these scanless approaches require higher laser powers per cell in general than our hybrid method. For example, with typical photostimulation duration (≥5 ms), about twice of the power is required using pure hologram compared with our hybrid strategy to achieve similar response in the same cells (Figure 2, Figure 2—figure supplement 1). It would likely require even more power for the same excitation with temporal focusing, as its tighter axial confinement would excite less of the membrane. On the other hand, the area-activation of scanless activation generally gives lower latencies and less jitter, compared to scanning strategies. However, as we show in our hybrid scanning approach, even with low powers and longer scan times, we can obtain latencies under 10 ms, with little jitter (<1 ms, Figure 1—figure supplement 2). Taken together, the spiral scan strategy we adapted requires a lower laser power budget per cell, and is very scalable towards activating large number of simultaneously targeted cells, making it a practical tool to study ensembles in neural circuits. One key strategy we exploited to lower the total average laser power in patterned photostimulation was to employ a low-repetition-rate laser for photostimulation. The average laser power Pave scales with the product of laser peak power Ppeak and pulse repetition rate frep. Since the laser beam is split into M beamlets to target M individual cell, the two-photon excitation for each cell scales with (Ppeak/M)2 (Denk et al., 1990). To maintain the required Ppeak for a large M, we reduced frep instead of increasing Pave. The two-photon photostimulation laser we used had a low frep (200 kHz ~ 1 MHz), leading to a significant increase in Ppeak and thus the number of possible simultaneously targeted cells M, with the same Pave. We note that most opsins open ion channels, the average open time is much longer than the laser’s interpulse interval (1/frep), and multiple ions can be conducted during each photostimulation. This is in contrast to fluorescence, where at most a single photon is emitted for each absorption, and the lifetime is significantly shorter than the interpulse interval. Thus opsins are ideal targets for low-repetition rate, high peak power excitation. In addition, the repetition rate should be balanced with the photostimulation duration. When the photostimulation duration is very short (e.g. 1 ms), the whole cell body might not be covered well with enough pulses in the spiral scan approach. In these scenarios, a higher repetition rate could be more favorable. The optimal conditions will likely be cell- and opsin-dependent, but would be expected to follow our trends. We choose an ETL for volumetric imaging, because of its low cost and good performance for focusing. Many other options exist including SLM (Yang et al., 2016), ultrasound lens (Kong et al., 2015), remote focusing (Botcherby et al., 2012; Sofroniew et al., 2016) and acousto optic deflector (Duemani Reddy et al., 2008; Grewe et al., 2010; Katona et al., 2012); see Ref. (Yang and Yuste, 2017), for a complete review. One future modification could be replacing the ETL with a second SLM to perform multiplane imaging (Yang et al., 2016) and adaptive optics (Ji, 2017), which could increase the frame rate and improve the imaging quality. Another important consideration in our all-optical method was to minimize the cross-talk between imaging and photostimulation. We chose the calcium indicator GCaMP6 and the red-shift opsin C1V1-mCherry, which has a minimized excitation spectrum overlap. Nevertheless, there is still a small cross-talk between the two, as C1V1 has a blue absorption shoulder, and GCaMP6 has a red shifted absorption tail. The first cross-talk affects neuronal excitability, and is the result of photostimulation by the imaging laser. Although the C1V1 we used was red-shifted, it can still be excited at 920 ~ 940 nm, the typical wavelengths used to image GCaMP6. This cross-talk highly depends on the relative expression of the calcium indicators and opsin (Rickgauer et al., 2014; Packer et al., 2015). For this reason, the imaging laser power was kept as low as possible to values that are just sufficient for imaging. But if the calcium indicator is weakly expressed, hence naturally dim, the increased imaging power may bias the neuronal excitability. Indeed, our cell-attached electrophysiology recording indicates that neuron firing rate has a trend to increase as the imaging laser power increases. However, we found no significant difference of the firing rate under our normal volumetric imaging conditions (Figure 1—figure supplement 3), where the laser power was typically below 50 mW and could be up to 80 mW for layers deeper than ~ 250 μm. Nevertheless, as red indicators keep improving, a future switch toward ‘blue’ opsins again will be desirable to reduce the spectral overlap between opsin and indicator. The second type of cross-talk affects the high fidelity recording of neural activity, and is caused by fluorescence (or other interference) generated by the photostimulation laser directly, which may cause background artifact on the calcium signal recording. To avoid this, in our experiments we use a narrow filter (passband: 500 nm ~ 520 nm) for GCaMP6 signal detection. C1V1 is co-expressed with mCherry, which has negligible fluorescence at the filter’s passband. But, in addition, GCaMP6 can still be excited at the photostimulation laser’s wavelength at 1040 nm. Typically this fluorescence is weak and does not impact the data analysis (e.g. Figure 3). However, if the baseline of GCaMP6 is relatively high or the number of simultaneously targeted neurons is large, it could cause a significant background artifact in the calcium imaging, identified as sharp rise and then sharp decay of fluorescence signals (Figure 1—figure supplement 4). If the photostimulation duration is short (e.g. Figure 4, only one frame appears to have the artifact), and stimulation frequency infrequent, the impacted frames could simply be deleted with negligible data loss. But if the photostimulation duration is long (e.g. Figure 5), the calcium imaging movie can be pre-processed so that the mesh grid shape background is replaced by their adjacent pixel value (see Materials and Methods). The ‘mesh’ arises because the interpulse interval of the laser is greater than the pixel rate, so only selected pixels are compromised. The grid is non-uniform in the image because of the non-uniform resonant scanner speed. This pre-processing significantly suppresses the artifacts while maintaining the original signal. Nevertheless, to avoid any analysis bias, the neuronal response can be further approximated by measuring the ΔF/F signal right after the photostimulation, when there is no background artifact. Also, an alternative method is to gate the PMT, or the PMTs output during the photostimulation pulse, thought this requires dedicated additional electronics. In this case, there will be ‘lost’ signal, and this can be treated similarly by filling in the data with interpolation. Finally, the constrained nonnegative matrix factorization algorithm (Pnevmatikakis et al., 2016) used to extract the fluorescence signal could also help, as it can identify the photostimulation artifact as part of the background and subtract it from the signal. With these corrections, the photostimulation artifacts can be eliminated from the extracted fluorescence trace in Figure 3~5. One strategy to reduce nonspecific stimulation is to reduce the size of the PSF by increasing the NA. In our current set of experiments, we use a relatively low excitation NA (~0.35) beam that is limited by the small mirror size (3 mm) of the post-SLM galvanometric scanners. Increasing the mirror size is a straightforward future improvement that would increase this NA, and decrease the axial point spread function. This would also improve the effective axial resolution of photostimulation (currently ~ 20 μm, measured by displacing the 12 μm diameter spiral pattern relative to the targeted neuron, Figure 1—figure supplement 2), and thus reduce the nonspecific activation of the non-targeted cells. Another approach to reduce the nonspecific activation is to use a somatic-restricted opsin. Somatic-restricted opsins were reported recently (Baker et al., 2016; Pégard et al., 2017; Shemesh et al., 2017), and showed reduced, but not eliminated, activation of non-targeted cells in vitro. Finally, it remains possible that a significant number of nonspecific activated cells occur through physiological synaptic activation by the photostimulated neurons. Our method could have wide utility in neuroscience. We demonstrate the successful manipulation of the targeted neural microcircuits in awake head-fixed behaving mice by photostimulating a targeted group of interneurons (Figure 5), and we expect this 3D all-optical method would find its many other applications in dissecting the neural circuits. Though we only targeted neurons in cortical layers 2/3, the total targetable range of the SLM can be more than 500 µm (Yang et al., 2016), thus covering layers 2/3 and 5 simultaneously. Questions such as how neural ensembles are being organized across different cortical layers, and how different neural assemblies across a 3D volume interact with each other can now be directly explored. Indeed, by identifying behavior-related neural ensemble using closed-loop optogenetics (Grosenick et al., 2015; Carrillo-Reid et al., 2017), one may be able to precisely control the animal behavior, which could have a significant impact in attempts to decipher neural codes and also provide an optical method for potential treatment of neurological and mental diseases in human subjects. The optical setup is illustrated in Figure 1A, which is composed of two femtosecond pulse lasers and a custom-modified two-photon laser scanning microscope (Ultima In Vivo, Bruker Corporation, Billerica, Massachusetts). The laser source for imaging is a pulsed Ti:sapphire laser (Chameleon Ultra II, Coherent, Inc., Santa Clara, California). Its wavelength is tuned to 940 nm for GCaMP6s or GCaMP6f imaging or 750 nm for mCherry imaging respectively. The laser power is controlled with a Pockels cell (350–160-BK Pockels cell, 302RM controller, Conoptics, Inc., Danbury, Connecticut). The laser beam is expanded by a 1:3.2 telescopes (f = 125 mm and f = 400 mm) and coupled to an ETL (EL-10-30-C-NIR-LD-MV, Optotune AG, Dietikon, Switzerland) with a clear aperture of 10 mm in diameter. The transmitted beam is rescaled by a 3.2:1 telescope (f = 400 mm and f = 125 mm) and imaged onto a resonant scanner and galvanometric mirror, both located at the conjugate planes to the microscope’s objective pupil. The beam is further scaled by a 1:1.33 telescope before coupled into a scan lens (f = 75 mm), a tube lens (f = 180 mm) and the objective lens (25x N.A. 1.05 XLPlan N, Olympus Corporation, Tokyo, Japan), yielding an excitation NA ~ 0.45. The laser can also be directed to a non-resonant scanning path (without ETL) where both X and Y scanning are controlled by galvanometric mirrors. The fluorescence signal from the sample is collected through the objective lens and split at a dichroic mirror (HQ575dcxr, 575 nm long pass, Chroma Technology Corp., Bellows Falls, Vermont) to be detected in two bi-alkali photomultiplier tubes, one for each wavelength range. Two different bandpass filters (510/20–2P, and 607/45–2P, Chroma Technology Corp., Bellows Falls, Vermont) are placed in front of the corresponding PMT respectively. The optical path for the photostimulation is largely independent from the imaging, except that they combine at a dichroic mirror (T1030SP, 1030 nm short pass, Chroma Technology Corp., Bellows Falls, Vermont) just before the scan lens, and then share the same optical path. The laser source for photostimulation is a low repetition rate (200 kHz ~ 1 MHz) pulse-amplified laser (Spirit 1040–8, Spectra-physics, Santa Clara, California), operating at 1040 nm wavelength. Its power is controlled by a Pockels cell (1147-4-1064 Pockels cell, 8025RS-H-2KV controller, FastPulse Technology, Saddle Brook, New Jersey). A λ/2 waveplate (AHWP05M-980, Thorlabs, Inc. Newton, New Jersey) is used to rotate the laser polarization so that it is parallel to the active axis of the spatial light modulator (HSP512-1064, 7.68 × 7.68 mm2 active area, 512 × 512 pixels; Meadowlark Optics, Frederick, Colorado). The beam is expanded by two telescopes (1:1.75, f = 100 mm and f = 175 mm; 1:4, f = 50 mm and f = 200 mm) to fill the active area of the SLM. The reflected beam from the SLM is scaled by a 3:1 telescope (f = 300 mm and f = 100 mm) and imaged onto a set of close-coupled galvanometer mirrors, located at the conjugate plane to the microscope’s objective pupil. A beam block made of a small metallic mask on a thin pellicle is placed at the intermediate plane of this telescope to remove the zeroth-order beam. The photostimulation laser beam reflected from the galvanometer mirrors are then combined with the imaging laser beam at the 1030 nm short pass dichroic mirror. The imaging and photostimulation is controlled by a combination of PrairieView (Bruker Corporation, Billerica, Massachusetts) and custom software (Yang, 2018) running under MATLAB (The Mathworks, Inc. Natick, Massachusetts) on a separate computer. The Matlab program was developed to control the ETL through a data acquisition card (PCIe-6341, National Instrument, Austin, Texas) for volumetric imaging, and the SLM through PCIe interface (Meadowlark Optics, Frederick, Colorado) for holographic photostimulation (Yang, 2018). The two computers are synchronized with shared triggers. At the end of each imaging frame, a signal is received to trigger the change of the drive current (which is converted from a voltage signal from the data acquisition card by a voltage-current converter [LEDD1B, Thorlabs, Inc. Newton, New Jersey]) of the ETL, so the imaging depth is changed for the following frame. The range of the focal length change on sample is ~+90 μm ~ −200 μm (‘+” means longer focal length). The intrinsic imaging frame rate is ~ 30 fps with 512 × 512 pixel image. The effective frame rate is lower as we typically wait 10 ~ 17 ms in between frames to let the ETL fully settle down at the new focal length. The control voltage of the Pockels cell is switched between different imaging planes to maintain image brightness. The typical imaging power is < 50 mW, and could be up to 80 mW for layers deeper than ~ 250 μm. The Matlab programs to control the ETL for volumetric imaging and SLM for holographic photostimulation (Yang, 2018) is available at https://github.com/wjyangGithub/Holographic-Photostimulation-System with a GNU General Public License, version 3 (copy archived at https://github.com/elifesciences-publications/Holographic-Photostimulation-System). where [xi, yi, zi] (i = 1,2…M) is the coordinate of the cell body centroid (M targeted cells in total), and Ai is the electrical field weighting coefficient for the ith target (which controls the laser power it receives). Zm0(u,v) and Cm0(zi) are the Zernike polynomials and Zernike coefficients, respectively, which sets the defocusing and compensates the first-order and second-order spherical aberration due to defocusing. Their expressions are shown in Table 1. The hologram can also be generated by 3D Gerchberg-Saxton algorithm, with additional steps to incorporate spherical aberration compensation. We adapt Equation (1) as a simpler method. For the experiments in Figure 2, and Figure 2—figure supplement 1, the Gerchberg-Saxton algorithm is used to generate a disk with a diameter similar to the neurons. Expression of Zernike polynomials and Zernike coefficients in Equation (1). n, refractive index of media between the objective and sample; k, the wavenumber; z, the axial shift of the focus plane in the sample; u, v, coordinates on the SLM phase mask; nsinα, the NA of the objective. To match the defocusing length set in SLM with the actual defocusing length, we adjusted the ‘effective N.A.’ in the Zernike coefficients following the calibration procedure described in Ref. (Yang et al., 2016). To register the photostimulation beam’s targeting coordinate in lateral directions, we projected 2D holographic patterns to burn spots on the surface of an autofluorescent plastic slide and visualized them by the imaging laser. An affine transformation can be extracted to map the coordinates. We repeated this registration for every 25 μm defocusing depth on the sample, and applied a linear interpolation to the depths in between. An alternative method to register the targeting coordinate is to set the photostimulation laser in imaging mode, actuate the SLM for different lateral deflection, and extract the transform matrix from the acquired images and that acquired from the imaging laser. To characterize the lateral registration error, we actuated the SLM and burned spots on the surface of an autofluorescent plastic slide across a field of view of 240 μm x 240 μm with a 7 × 7 grid pattern. We then imaged the spots pattern with the imaging laser and measured the registration error. This was repeated for different SLM focal depths. To characterize the axial registration error, we used the photostimulation laser to image a slide with quantum dots sample. The SLM was set at different focal depths, and a z-stack was acquired for each setting to measure the actual defocus and thus the axial registration error. In all these registration and characterization procedures, we used water as the media between the objective and the sample, and we kept the focus of the photostimulation laser at the sample surface by translating the microscope stage axially. We note that the refractive index of the brain tissue is slightly different from that of water (~2%), and this could cause an axial shift of the calibration. This could be corrected in the Zernike coefficients. In practice, we found this effect is negligible, as the typical focal shift by the SLM is relatively small (<150 μm) and the axial PSF is large. Due to the chromatic dispersion and finite pixel size of SLM, the SLM’s beam steering efficiency drops with larger angle, leading to a lower beam power for targets further away from the center field of view (in xy), and nominal focus (in z). The characterization result is shown in Figure 1—figure supplement 1. A linear compensation can be applied in the weighting coefficient Ai in Eq. (1) to counteract this non-uniformity. In practice, these weighting coefficients can be adjusted such that the targeted neurons show clear response towards photostimulation. Before each set of experiments on animals, we verify the system (laser power, targeting accuracy, power uniformity among different beamlets from the hologram) by generating groups of random spots through holograms, burning the spots on an autofluorescent plastic slide, and comparing the resultant image with the desired target. All experimental procedures were carried out in accordance with animal protocols approved by Columbia University Institutional Animal Care and Use Committee. Multiple strains of mice were used in the experiment, including C57BL/6 wild-type and SOM-cre (Sst-cre) mice (stock no. 013044, The Jackson Laboratory, Bar Harbor, Maine) at the age of postnatal day (P) 45–150. Virus injection was performed to layer 2/3 of the left V1 of the mouse cortex, 3 ~ 12 weeks prior to the craniotomy surgery. For the C57BL/6 wild-type mice, virus AAV1-syn-GCaMP6s (or AAV1-syn-GCaMP6f) and AAVDJ-CaMKII-C1V1-(E162T)-TS-p2A-mCherry-WPRE was mixed and injected for calcium imaging and photostimulation; virus AAV8-CaMKII-C1V1-p2A-EYFP was injected for electrophysiology. For the SOM-cre (Sst-cre) mice, virus AAV1-syn-GCaMP6s and AAVDJ-EF1a-DIO-C1V1-(E162T)-p2A-mCherry-WPRE was mixed and injected. The virus was front-loaded into the beveled glass pipette (or metal pipette) and injected at a rate of 80 ~ 100 nl/min. The injection sites were at 2.5 mm lateral and 0.3 mm anterior from the lambda, putative monocular region at the left hemisphere. After 3 ~ 12 weeks of expression, mice were anesthetized with isoflurane (2% by volume, in air for induction and 1–1.5% during surgery). Before surgery, dexamethasone sodium phosphate (2 mg per kg of body weight; to prevent cerebral edema) were administered subcutaneously, and enrofloxacin (4.47 mg per kg) and carprofen (5 mg per kg) were administered intraperitoneally. A circular craniotomy (2 mm in diameter) was made above the injection cite using a dental drill. A 3 mm circular glass coverslip (Warner instruments, LLC, Hamden, Connecticut) was placed and sealed using a cyanoacrylate adhesive. A titanium head plate with a 4 mm by 3.5 mm imaging well was attached to the skull using dental cement. After surgery, animals received carprofen injections for 2 days as post-operative pain medication. The imaging and photostimulation experiments were performed 1 ~ 21 days after the chronic window implantation. During imaging, the mouse is either anesthetized with isoflurane (1–1.5% by volume in air) with a 37°C warming plate underneath or awake and can move freely on a circular treadmill with its head fixed. Visual stimuli were generated using MATLAB and the Psychophysics Toolbox (Brainard, 1997) and displayed on a monitor (P1914Sf, 19-inch, 60 Hz refresh rate, Dell Inc., Round Rock, Texas) positioned 15 cm from the right eye, at 45o to the long axis of the animal. Each visual stimulus session consisted of four different trials, each trial with a 2 s drifting square grating (0.04 cycles per degree, two cycles per second), followed by 18 s of mean luminescence gray screen. Four conditions (combination of 10% or 100% grating contrast, 0o or 90o drifting grating direction) were presented in random order in the four trials in each session. The pulse repetition rate of the photostimulation laser used in the experiment is 500 kHz or 1 MHz. The photostimulation laser beam is split into multiple foci, and spirally scanned (~12 μm outer spiral diameter, 8 ~ 50 rotations with progressively shrinking radius; the whole spiral can be continuously repeatedly scanned) by a pair of post-SLM galvanometric mirror over the cell body of each target cell. For neurons in layer 2/3 of mice V1, the typical average power used for each spot is 2 mW ~ 5 mW. When studying the photostimulation effect on the non-targeted cells (Figure 3), we specifically used long photostimulation durations (480 ms ~ 962 ms) to emulate an undesirable photostimulation scenario. In the normal condition, the photostimulation duration is < 100 ms, which was composed of multiple continuously repeated spiral scans, each lasting < 20 ms (Figure 4). In the experiments where short photostimulation duration (≤20 ms, Figure 2) is used, the stimulation was composed of a single spiral scan which consists of ~ 50 rotations with progressively shrinking radius. In the experiment that the SOM cells were photostimulated when the mouse were receiving visual stimuli (Figure 5), the photostimulation started 0.5 s before the visual stimuli, and ended 0.3 s after the visual stimuli finished. Since the visual stimuli lasted for 2 s, the photostimulation lasted for 2.8 s. This long photostimulation was composed of 175 continuously repeated spiral scans, each lasting ~ 16 ms. In our experiments, the lateral separation of the simultaneously targeted cell ranges from ~ 10 µm to ~ 315 µm, and the axial separation ranges from 30 µm to 150 µm. The recording from each plane was first extracted from the raw imaging files, followed by motion correction using a pyramid approach (Thévenaz et al., 1998) or fast Fourier transform-based algorithm (Dubbs et al., 2016). A constrained nonnegative matrix factorization (CNMF) algorithm (Pnevmatikakis et al., 2016) was used to extract the fluorescence traces (ΔF/F) of the region of interested (i.e. neuron cell bodies in the field of view). The CNMF algorithm also outputs a temporally deconvolved signal, which is related to the firing event probability. The ΔF/F induced by the photostimulation was quantified with the mean fluorescence change during the photostimulation period over the mean fluorescence baseline within a 0.5 ~ 2 s window before the photostimulation. To detect the activity events from each recorded neuron, we typically thresholded the temporally deconvolved ΔF/F signal with at least two standard derivations from the mean signal. Independently, a temporal first derivative is applied to the ΔF/F trace. The derivative is then threshold at least two standard derivations from the mean. At each time point, if both are larger than the threshold, an activity event is recorded in binary format. In case the auto-detected activity event has large deviations from manual inspection (based on typical shapes of calcium transient), the thresholding value is adjusted so that the overall auto-detection agrees with manual inspection. A cell is determined as not responding to photostimulation if there is no single activity event detected or no typical action-potential-corresponding calcium transient during photostimulation period for multiple trials. These non-responding cells could be due to a poor expression of C1V1. Any GCaMP can generate fluorescence background during photostimulation (Discussion). This background would reduce the sensitivity of the calcium imaging. Since the pixel rate (~8.2 MHz) of the calcium imaging recording is much faster than the photostimulation laser’s pulse repetition rate (200 kHz ~ 1 MHz), the fluorescence background appears to be a mesh grid shape in the calcium imaging movie (Figure 1—figure supplement 4). Typically it is small and does not impact the above data analysis (e.g. Figure 3). In the case that it is strong, if the photostimulation duration is short (e.g. Figure 4, only one frame appears to have the artifact), the impacted frames can be deleted with negligible data loss. If the photostimulation duration is long (e.g. Figure 5), the recorded frames during photostimulation are pre-processed to suppress this background artifact (Figure 1—figure supplement 4). To detect the pixels having this artifact, we consider both their fluorescence value and their geometry. First we detect candidate pixels by identifying pixels whose value is significantly higher from the average value calculated from a few frames just before and just after the stimulation. Second, these candidate pixels are tested for connectedness within every horizontal and vertical line of each frame, and the width of the connections compared to that expected based on the stimulation condition. If both these conditions hold, these pixels are marked as ‘contaminated’ and the fluorescence value at these pixels during the stimulation are replaced by those in their adjacent ‘clean’ pixels. This pre-processing significantly suppresses the artifacts while maintaining the original signal. Nevertheless, to avoid any analysis bias, we further approximated the neuronal response by using the ΔF/F signal just after the photostimulation, when there was no background artifact. The same analysis procedure was implemented to the control experiment when there was no photostimulation. The orientation selectivity index and preference of the visual stimuli is calculated as the amplitude and sign of (ΔF/F|90 - ΔF/F|0) / (ΔF/F|90 + ΔF/F|0) respectively, where ΔF/F|90 and ΔF/F|0 is the mean ΔF/F during the visual stimuli with 90o and 0o drifting grating respectively. Mice were head-fixed and anaesthetized with isoflurane (1.5 ~ 2%) throughout the experiment. Dura was carefully removed in the access point of the recording pipette. 2% agarose gel in HEPES-based artificial cerebrospinal fluid (ACSF) (150 mM NaCl, 2.5 mM KCl, 10 mM HEPES, 2 mM CaCl2, 1 mM MgCl2, pH was 7.3) was added on top of the brain to avoid movement artifacts. Patch pipettes of 5 ~ 7 MΩ pulled with DMZ-Universal puller (Zeitz-Instrumente Vertriebs GmbH, Planegg, Germany) were filled with ACSF containing 25 μM Alexa 594 to visualize the tip of the pipettes. C1V1-expressing cells were targeted using two-photon microscopy in vivo. During recordings, the space between the objective and the brain was filled with ACSF. Cell-attached recordings were performed using Multiclamp 700B amplifier (Molecular Devices, Sunnyvale, California), in voltage-clamp mode. The sampling rate was 10 kHz, and the data was low-pass filtered at 4 kHz using Bessel filter. Annual Review of Biophysics 46:271–293. Current Opinion in Neurobiology 26:96–102. Optics in the Life Sciences BrM3B.4. Frontiers in Neural Circuits 2:5. Journal of Neurophysiology jn 00275 02016. Thank you for submitting your work entitled "Three-dimensional Two-photon Optogenetics and Imaging of Cortical Circuits in vivo" for consideration by eLife. Your article has been reviewed by two peer reviewers, one of whom, Karel Svoboda is a member of our Board of Reviewing Editors and the evaluation has been overseen by a Senior Editor. The reviewers appreciated the great potential of the photostimulation method. But the paper fell short in documenting the technical advances. The central claim of the paper is that the use of scanning galvos coupled with scanless SLM system for optogenetic stimulation greatly reduces the power required to photostimulate neurons relative to other 3D holography techniques. This was not directly shown. Moreover, optical and electrical crosstalk has not been characterized sufficiently. Previous work demonstrated the ability to manipulate specific cells with single-neuron precision within a given optical plane (2-dimensional stimulation). The aim of this work was to expand the number of addressable neurons by enabling stimulation in 3-dimensions using modest laser powers. The method (ability to stimulate 27 neurons in 3D) represents an advance in this field. The method portion that is novel is not thoroughly characterized. Figure 1: Schematic of microscope and quantification of z-psf on photostimulation path. Important, z-psf is relatively broad due to the small size of the galvo, they could have made it tighter (at the expense of the size of the field-of-view). They also characterize targeting error and excitation efficiency relative to position in field of view. Overall, characterization of photostimulation path is thorough. Spike count vs stimulation power and spiral duration. Spike latency, jitter and spatial resolution are all comparable to those reported from previous work that employed the same photostimulation technique (Packer, 2015). They need to provide more detail about how this measurement was done. How many different off-target spots were stimulated and where were they? What power and duration? Why is there no quantification of excitation caused by the imaging laser? They do not mention the power used for imaging; in the discussion they state that they kept the imaging power "as low as possible". Why are such long duration spirals used (up to 400 ms)? Excitation is maximized when the duration of the spiral is much less than the off time constant of the channel (40ms for C1V1). Figure 2: They illustrate, as has been shown in previous work, that neurons that are targeted are reliably excited. The map highlights the effects of a broad z-psf. It would be nice to see if they could efficiently excite their targeted neurons with lower powers or durations while improving the spatial resolution. Figure 3: The novelty is the ability to stimulate a 'large' number of neurons simultaneously. This capability is only demonstrated anecdotally in an experiment in which they simultaneously stimulate 27 neurons. The efficiency doesn't seem to drop off much going from 15 targeted neurons up to 27 targeted neurons. Would it have been possible to stimulate more? Can they move from 70% activation for the 27 neuron group up to 100% by changing stimulation parameters (i.e. power, duration, # of spirals)? Better characterization of the limits of the method is absolutely necessary. Figure 4: To make this experiment more interesting it would be nice to demonstrate a result that could not be achieved by less sophisticated methods such as 1-photon stimulation. One such example would be to show how the change in selectivity in the population depends on the particular SOM neurons that were stimulated. What happens if another group of SOM neurons is stimulated? As stated by the authors in the Discussion section: "it has become the norm to use holographic approaches" for 2P stimulation of single or multiple opsin-expressing neurons. The central advance of this paper is the use of scanning galvos coupled with beamlets produced by a scanless SLM system for optogenetic stimulation. The authors claim this greatly reduces the power required to photostimulate neurons relative to other 3D holography techniques, which allows for further multiplexing of the beam and stimulation of more neurons. Unfortunately, this claim is not experimentally validated by the authors anywhere in the submitted manuscript. The manuscript suffers from a lack of rigor that is necessary to push the field forward and is poorly written. 1) Test the central claim of the paper: The microscope setup should be able to switch between scanless 3D holography, and the hybrid holographic-galvo spiral stimulation approach which the authors' claim greatly lowers the light powers required for stimulation. Both stimulation techniques could be used on the same animal with the same low-repetition laser. This would elegantly control for hardware and animal-to-animal variability (particularly opsin expression level). Please demonstrate that the light dosage required to stimulate neurons, either by GCaMP readout or cell-attached electrophysiology recordings (the latter would be better), is much smaller for the hybrid approach relative to scanless holography. I notice that the stimulation time is quite long for the spiral stimulation (the Materials and methods section has large range 10-2800 ms), so be sure to match time of stimulation as well as power to compare light dosage vs. excitability. In my opinion, this set of experiments is essential for the manuscript to be considered for publication. a) The authors' use cell attached recordings to measure latency and jitter of their stimulation paradigm, so they are proficient with in vivo electrophysiology. Please measure perturbations to cell activity (cell-attached) and membrane potential (whole cell) of C1V1 expressing cells when 2P scanning with typical conditions for GCaMP imaging. Please verify that the C1V1 cells that are recorded from also respond to the stimulation paradigm to confirm suitable expression levels. b) The authors show an example for optical cross talk of the opsin-stimulation beam during GCaMP imaging (Figure 1—figure supplement 3), and their software solution. Please provide quantification for how large the artifacts tend to be, and how well the data processing removes it. One experiment to include would be to stimulate cells in a mouse with only GCaMP (no C1V1), and measure what percentage of cells, after implementing the data processing pipeline, are still characterized as stimulated by the activation criteria written in the methods. This will give a sense for false positives. 3) The authors report in the Results section "response rate of individual targeted cell remained high and stable (Figure 3F, 82% +- 9%). Within a group of cells that were simultaneously photostimulated, the percentage of responsive cells was also stable (Figure 3G, 82% +- 9%)." a) I do not understand Figure 3F. The stimulus conditions presented conditions go from 1-27 targets. The y-axis reports individual targeted cell response rate. What I imagine this graph is showing is the number of cells that were responsive during each of these conditions, yet that appears to be what Figure 3G is presenting. Is this graph showing excitation of each cell one at a time in all conditions (e.g. marching through each of 27 neurons in condition 7)? If so, what is the value of this graph? Figure 3G makes much more sense to me. b) Figure 3F and 3G have very different distributions as a function of stimulation condition, so I find it hard to believe that the quoted percentage (82% +- 9%) is identical for both graphs. c) I disagree with the assessment that the percentage of responsive cells is stable. The histogram peaks appear to generally decline with further multiplexing of the beam. I would eliminate this statement. Thank you for submitting your article "Three-dimensional Two-photon Optogenetics and Imaging of Cortical Circuits in vivo" for consideration by eLife. Your article has been reviewed by two peer reviewers, one of whom is a member of our Board of Reviewing Editors and the evaluation has been overseen by a Senior Editor. The following individual involved in review of your submission has agreed to reveal his identity: Bernardo L Sabatini (Reviewer #2). The manuscript has improved. The presentation is much clearer, and the benefits over and comparisons to previous techniques are better stated. The data is now better quantified. The techniques are more thoroughly explained and many previously missing details have been added. Given that adding scan mirrors is a straightforward modification to most SLM based stimulation systems, this method could be readily adopted by many labs. The comparison between scanning and scan-less approaches (Figure 1—figure supplement 2) is still scant. Given that many cells can be targeted at once, why is this analysis done for only 9 cells across 2 mice? If the main goal of this paper is to maximize the number of neurons activated in some fixed time window, it is important to know how much faster cells can be activated using scanless techniques than scanning techniques. If scanless stimulation can activate cells significantly faster then, it might be a more efficient way to excite many cells in a fixed time window than the scanning techniques presented here. It is nice to see a larger population activated than in the previous version. But what is the reason why so many cells fail to respond? Is it simply that they weren't expressing enough C1V1? This is worth checking via fluorescence of mCherry and discussing in the text. Add some information about the depth of the cells in this analysis. Regarding Figure 1—figure supplement 4. There appears to be some activation from scanning at 90mw relative to 0mw. A t-test should give a p-value around 0.05. The text should address this. There are several relatively straightforward analysis steps that the authors should take to address the concerns regarding why cells that fail to respond during ensemble stimulation. Can the cells that fail to respond during ensemble stimulation be stimulated by themselves or are they just not excitable? 1) We demonstrated the simultaneous photostimulation of 83 cells across a relatively large cortical volume (480x480x150 μm3) in awake mice, using a total power of 300 mW with a photostimulation duration of 94 ms, while monitoring the neural activity in the network with GCaMP6f. We believe this represents an important advancement in the field. This result is reported in Figure 3 and Figure 3—figure supplement 1. 2) In our original manuscript, we discussed that our hybrid scanning approach which coupled scanning galvanometers with SLM hologram required a smaller power than other scanless approaches. We did not proof this experimentally. In the revision, we added a set of experiments for this comparison. We found that our approach took about half of the power to evoke a similar response in neurons when comparing with the scanless approach. This experiment supports our original claim. This result is reported in Figure 1—figure supplement 2. 3) We also performed a detailed characterization of the cross talk between imaging and photostimulation. a) Imaging into photostimulation. We performed electrophysiological recordings and showed that our imaging conditions did not cause a significant increase of cell firing rates when comparing to “normal” spontaneous activity of these cells (both lasers off). This result is reported in Figure 1—figure supplement 4.
b) Photostimulation into imaging. We detailed various strategies in data processing to treat this cross-talk and think this is of practical utility to many readers. These discussions can be found in Discussion section and subsection “Data analysis”. 4) We documented the experiment parameters for each dataset and the statistical analysis used in each figure in detail. 2) Figure 1: Schematic of microscope and quantification of z-psf on photostimulation path. Important, z-psf is relatively broad due to the small size of the galvo, they could have made it tighter (at the expense of the size of the field-of-view). They also characterize targeting error and excitation efficiency relative to position in field of view. Overall, characterization of photostimulation path is thorough. 1) In the previous version, this data was presented for single exemplar (which was stated in the figure caption). In the revision, we added in more data. The overall results stay the same (Figure 1G, Figure 1—figure supplement 3A-B). These results were obtained from cell-attached electrophysiology, which are stated in the corresponding figure captions. 2) For the spatial resolution of the photostimulation, we changed the photostimulation position versus the targeted cell position and read out the cell response either by cell-attached electrophysiology recording (Figure 1—figure supplement 3C-D), or GCaMP6s (Figure 1—figure supplement 3E-F). These two sets of experiments are done independently, and they show similar results. In Figure 1—figure supplement 3C-F, we added an inset showing the experiment schematics. Furthermore, we labeled the off-target spots in C and E, so the readers can read out how many and where they are from the figure: for cell-attached electrophysiology recording, the number of off-target spots was 6 for lateral distance, and 10 for axial distance; for GCaMP6s recording, this number was 32 and 10 respectively. 3) We added the powers and duration for this experiment in the figure caption. In the revision, all these parameters have been stated in each experiment for each figure, as well as in the Materials and methods section. In the revised manuscript, please see Figure 1G, Figure 1—figure supplement 3. The experiment parameters are listed at the end of the caption in each figure. The pulse repetition rate of the photostimulation laser used in the experiment is 500 kHz or 1 MHz. […] This long photostimulation was composed of 175 continuous spiral scans, each lasting ~16 ms. The laser power used for resonant scanning imaging was typically below 50 mW and could be up to 80 mW for layers deeper than ~250 μm. We added this information in the Discussion section and Materials and methods section. In addition, we performed electrophysiology recording and showed that our imaging conditions did not cause a significant increase of cell firing rates when comparing to “pure” spontaneous activity (all lasers off). This is shown in Figure 1—figure supplement 4. 1) Figure 2, and Figure 2—figure supplement 1. Long spiral duration was used to mimic a worst photostimulation condition. We investigated activation reliability and nonspecific activation effect. 2) Figure 3, where we show simultaneous photostimulation on large number of cells (>=50). We used the normal short spiral scan condition. The total photostimulation time was ~94 ms, which contained 5 continuous spiral scans, each lasting ~18.85 ms.
3) Figure 4, where we show SOM cell photostimulation during visual stimuli. The total duration of the visual stimuli was 2 seconds, and the total photostimulation time was 2.8 seconds, which contained 175 continuous spiral scans, each lasting ~16 ms.
We documented this at the corresponding figure captions, as well as in subsection “Photostimulation parameters”. 3) Figure 2: They illustrate, as has been shown in previous work, that neurons that are targeted are reliably excited. The map highlights the effects of a broad z-psf. It would be nice to see if they could efficiently excite their targeted neurons with lower powers or durations while improving the spatial resolution. Though the parameter of the photostimulation varied quite a lot (specifically for Figure 2—figure supplement 1, where a worst photostimulation condition was mimicked), the situation for the axial resolution and nonspecific photostimulation looked similar. While we are working towards the replacement of the galvo, our thought is that the photostimulation beam could hit the dendritic arbors from other cells that course over the photostimulation region. This was clearly evident in the original slice work from our lab in Packer et al., 2012. This could play an important role in the nonspecific photostimulation. Somatic restricted opsins would likely help, and in fact have been shown to improve the resolution (Baker et al., 2016). We note that this has nothing to do with the underlying optical technology, but molecular biology, and we would expect our system to have similar improvements, while maintaining its unique and powerful large volumetric targeting capability. We are working on getting those constructs and viruses in our lab, and we acknowledged that the improvement of galvo and the application of future somatic restricted opsin would help in subsection “Nonspecific Photostimulation”. 4) Figure 3: The novelty is the ability to stimulate a 'large' number of neurons simultaneously. This capability is only demonstrated anecdotally in an experiment in which they simultaneously stimulate 27 neurons. The efficiency doesn't seem to drop off much going from 15 targeted neurons up to 27 targeted neurons. Would it have been possible to stimulate more? Can they move from 70% activation for the 27 neuron group up to 100% by changing stimulation parameters (i.e. power, duration, # of spirals)? Better characterization of the limits of the method is absolutely necessary. Thank you for the critical comments. In the revision, this Figure 3 was moved to Figure 2. We performed additional experiments and presented them in the new Figure 3 and Figure 3—figure supplement 1. In Figure 3, the total number of simultaneous target cells are 40, 43 and 83. In Figure 3—figure supplement 1, the total number of simultaneous target cells is 50. Excluding the cells that never respond in all of the tested photostimulation patterns, the overall ensemble response rate (# of responsive cells / # of target cells) was 78% ± 7%, which is slightly worse than 82% ± 9% reported in Figure 2 (3~27 simultaneous target cells). In this new set of experiments, the photostimulation power was 3.6~4.8 mW/cell, and the photostimulation time was 94 ms, which contained 5 continuous complete spiral scans, each lasting 18.85 ms. In particular, the total power for the 83 cells case was 300 mW. The reduction of the photostimulation time reduced the ensemble response rate (data not shown). Although it would be possible to increase the power and photostimulation duration to increase the number of target cells as well as the ensemble response rate, we felt it better to limit the total power to values that have been shown not to cause heating damage with sustained illumination. As for cellular “failures”, it is possible that when large number of pyramidal cells are targeted, they could also activate interneurons, which could in return suppress these pyramidal cells. The network dynamics pose a question on whether 100% activation rate can be achieved, and this could be a future study subject. It would require extensive electrophysiological studies and controls to test these hypotheses, and we believe these well beyond the scope of this paper. In the revised manuscript, please see Figure 3, Figure 3 —figure supplement 1. 5) Figure 4: To make this experiment more interesting it would be nice to demonstrate a result that could not be achieved by less sophisticated methods such as 1-photon stimulation. One such example would be to show how the change in selectivity in the population depends on the particular SOM neurons that were stimulated. What happens if another group of SOM neurons is stimulated? Thank you for the suggestions. In Figure 4, we simultaneously photostimulated 9 SOM cells, which has much better spatial specificity than typical one-photon stimulation. We do agree that it would be nice to show how the network reacts when different group of SOM cells are stimulated. Indeed, we are working on this. Due to the setback of the availability of the SOM-cre animals, we would postpone this extended experiment as a future work dedicated to neuroscience study itself. Thank you for the critical comments and suggestions for the manuscript. In the revised manuscript, we presented additional experiments to support the argument that the hybrid scanning strategy requires less power than the scanless approach. We found that our approach took about half of the power to evoke a similar response in neurons when comparing with the scanless approach. In addition, we demonstrated the simultaneous photostimulation of 83 cells across a relatively large cortical volume (480x480x150 μm3) in awake mice, using a total power of 300 mW with a photostimulation duration of 94 ms, while monitoring the neural activity in the network with GCaMP6f. We believe this represents an important advancement in the field. Overall, our claim is that we extend the all-optical method (simultaneous imaging and photostimulation) from 2D to 3D, while being able to stimulate a relatively large number of cells in mice in vivo. To our knowledge, this is the first time to report two-photon photostimulation of such a large group of cells in 3D (83 cells across 150 μm depth range). Thank you for the critical comments and suggestions. In the revised manuscript, we present a set of experiment to compare the power requirement for the spiral scanning approach and the scanless approach using pure hologram. We performed experiments on 9 cells over 2 mice in vivo. For each cell, we compared the evoked ΔF/F from 3 conditions: (1) Spiral scanning at 5 mW, 20 ms stimulation duration (2) Scanless disk at 5 mW, 20 ms stimulation duration (3) Scanless disk at 9 mW, 20 ms stimulation duration. The spiral pattern and disk both covers the whole cell body, typically with a diameter of ~12 μm. With one-way ANOVA test, we found that the evoked ΔF/F response has a significant difference between condition (1), (2), and condition (2), (3). Condition (1) has a trend of larger ΔF/F than condition (3), but not significant. We thus make an argument that it took about half of the power in the hybrid scanning approach than the scanless pure hologram approach to achieve a similar response in the same cells. This data set is presented in Figure 1—figure supplement 2. In addition, we want to address the large range of stimulation time. There are three range of photostimulation time used in this manuscript: (1) Figure 2, and Figure 2—figure supplement 1. Long spiral duration (>400 ms but less than 1 second) was used to mimic a worst photostimulation condition. We investigated activation reliability and nonspecific activation effect. (2) Figure 3, where we show simultaneous photostimulation on large number of cells (>=50). We used the normal short spiral scan condition. The total photostimulation time was ~94 ms, which contained 5 continuous spiral scans, each lasting ~18.85 ms. (3) Figure 4, where we show SOM cell photostimulation during visual stimuli. The total duration of the visual stimuli was 2 seconds, and the total photostimulation time was 2.8 seconds, which contained 175 continuous spiral scans, each lasting ~16 ms.
We performed cell-attached electrophysiology recording on C1V1 expressing cells when the imaging laser was scanning over the plane where the cell located, at different power conditions. We verified the recorded cells were responding to photostimulation both before and after this experiment. One-way ANOVA test show no significant difference on the cell firing rate between condition of 0 mW and 35~90 mW. Our typical imaging power was below 50 mW, though it could be up to 80 mW for layers deeper than ~250 μm. Furthermore, the scanning of the imaging laser cycles through different imaging planes (typically separated by ~50 μm each), leading to a 3~4 fold reduction of power depositing to the same plane. This measurement shows that the effect of the imaging laser into cell firing rate in our all-optical experiment is almost negligible. This is reported in Figure 1—figure supplement 4. Note that this result is more or less in line with those reported earlier, in Rickgauer et al., (2014) and Packer et al., (2015). We did not perform the whole cell recording. It is certain that opsin activation produces subthreshold depolariazation in some cells, and we state as much. With respect to *firing*, and producing meaningful output that would drive network activity, we do not see considerable effect using our typical optical powers for imaging. As the focus of this paper is all optical interrogation, and the de facto standard of optical monitoring is calcium imaging, we use their established metrics of fluorescence transients to report the neural activity. 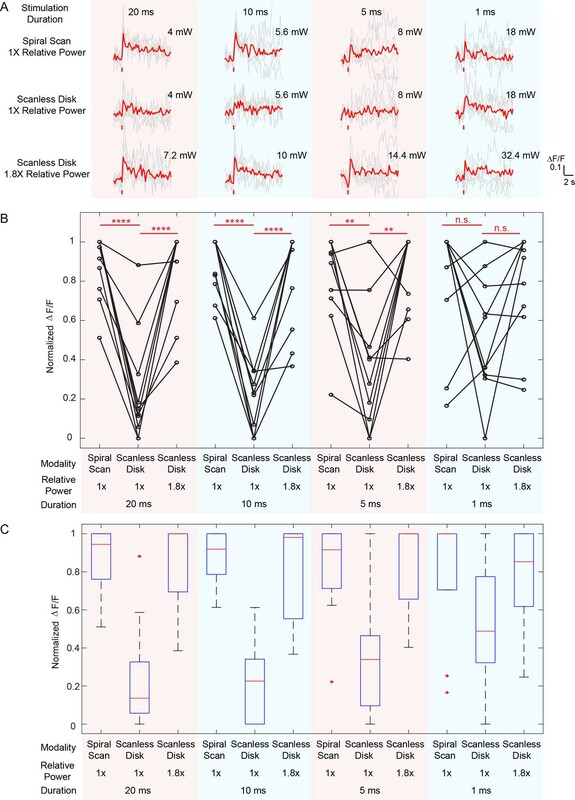 These transients are generally indicators of action potentials, not sub-threshold signals, and we used the cell attached spiking rate to characterize the ground truth of these signals. We feel that this is well aligned, and consistent with the majority of imaging and photostimulation studies. The cross-talk from opsin-stimulation into imaging was characterized as a sharp increase in fluoresce and then a sharp decrease (Figure 1—figure supplement 5), which is completely different from the dynamics of calcium transient. This cross-talk (fluorescence artifact) can be clearly identified by manual inspection. 1) Baseline of GCaMP6 is weak and the fluorescence artifact is weak. This would not impact the analysis, so no extra data processing is required. This is the case for Figure 2, and Figure 2—figure supplement 1. 2) Fluorescence artifact is strong. In a typical operation condition, the photostimulation duration is short. If the fluorescent artifact only appears within 1 frame of data for all the imaging plane, we delete this frame, with negligible data loss. This is the case for Figure 3. 3) Fluorescence artifact is strong and photostimulation duration is long. We proceeded the data processing to remove the artifact, as described in the original manuscript. This is the case for Figure 4. We added additional figure panels to Figure 1—figure supplement 5, which describes the effect of this data processing. We also quantified the artifact suppression effect. We analyzed the raw ΔF/F of the cells (only expressed with GCaMP6s but not C1V1) right before photostimulation and right after the photostimulation onset. With the artifact suppression procedure, the overall raw ΔF/F across different cells stay similar before photostimulation and right after the photostimulation onset, though the standard deviation of the latter is larger. Nevertheless, the extracted events between these two periods stay similar. This is shown in Figure 1—figure supplement 5D-E. This shows the effectiveness of our method. Finally, the constrained nonnegative matrix factorization algorithm used to extract the fluorescence signal could help, as it can identify the fluorescence artifact as part of the background and suppress it from the signal. With all these procedures, the artifacts are not seen from the extracted fluorescence traces in Figure 2~4. All the above are documented in subsection “Minimizing cross-talk between imaging and photostimulation”. The artifact size depends largely on the expression level of GCaMP6 (note: not C1V1). With a large number of target cells, the artifact could saturate the PMT. The above strategy provides a general guideline. As of which option to choose, one should always inspect the extracted fluorescence traces (by photostimulation trigger average) to determine whether there is artifact residue, and whether it would impact the subsequent data analysis. While the above procedures could suppress the artifacts in general, gated PMT which can shut down at the arrival of the photostimulation laser pulse could significantly help, as it could potentially facilitate a more unbiased analysis. The implementation of this hardware is currently in progress. We are sorry about this confusion. We explain the difference in the following discussion. Note in the revision, this figure was moved as Figure 2. 1) In Figure 2F, we characterized the response rate of individual targeted cells. 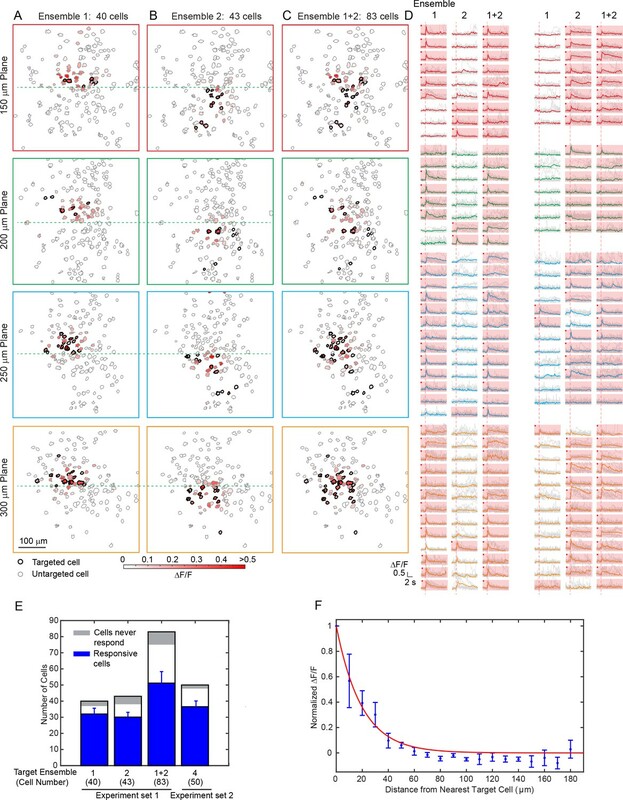 Multiple cells could be targeted together as an ensemble, but we were interested in the response rate in each individual cell (averaged across trials) within the targeted ensemble. 2) In Figure 2G, we were interested in the trial-to-trial response rate in the ensemble level, i.e. the ratio between the number of responsive cells and the total targeted cell within an ensemble. To be clear, we labeled “individual cell level response rate” for Figure 2F and “ensemble level response rate” for Figure 2G. These two graphs characterize different aspects of the reliability of the photostimulation. The mean and standard deviation for condition 1 and 2 is the same in both graphs, as there is only one targeted cell in a targeted ensemble. Provided that the sample size is large enough, the overall mean and standard deviation should be very similar for each condition. This explains why the response rate for both individual cell level and ensemble level is 82% ± 9%. We specifically changed the wording in the manuscript and stated that both response rate is 82% ± 9% to avoid possible confusion. The different distribution in these two graphs comes from the fact that response rate for each cell in Figure 2F was averaged over trials, and we plotted the distribution across different cells. For Figure 2G, each sample comes from a trial; that is why in condition 1 and 2, there were counts at 0% level. We indicated these difference in the figure caption. In the revised version, we eliminated this statement. Thank you for the critical comments and valuable suggestions. By addressing the comments and implementing additional experiments and analysis, we believe the quality of the manuscript has improved. 1) The comparison between scanning and scan-less approaches (Figure 1—figure supplement 2) is still scant. Given that many cells can be targeted at once, why is this analysis done for only 9 cells across 2 mice? We also performed additional experiments and added more cells. The results are consistent with the original experiment and bolster the conclusion. Note that we re-labelled this figure to be Figure 2—figure supplement 1. 1) The new comparisons at 20 ms, 10 ms, and 5 ms were consistent with the original result with 20 ms photostimulation duration: the hybrid approach requires about half of the laser power than the scanless approach to evoke similar response in the neuron. 2) At 1 ms photostimulation duration, on the other hand, the hybrid approach shows a trend with smaller power budget (but not significant, p=0.17 using one-way ANOVA test) than the scanless approach. We explained this result in the following. 1) The scanless approach employs a spatial multiplexed strategy, where the two-photon light is spatially distributed across the entire cell body; to maintain the two-photon excitation efficiency (squared-intensity) within its coverage area, a larger total power is typically required. The hybrid approach, on the other hand, is a combination of spatial (across different cells) and temporal (within individual cell) multiplexed strategy. While optimal strategy will depend on opsin photophysics, the opsin typically has a long opsin decay constant (10s of millisecond) and this favors the hybrid approach because the opsin channels can stay open during the entire (multiple) spiral scans. But at very short duration, the limited number of laser pulses per unit area may contribute to an efficiency drop of the hybrid approach versus scanless approach. 2) We added the above discussion in the Results section. In the revised manuscript, please see Figure 2, and Figure 2—figure supplement 1. 2) If the main goal of this paper is to maximize the number of neurons activated in some fixed time window, it is important to know how much faster cells can be activated using scanless techniques than scanning techniques. If scanless stimulation can activate cells significantly faster then, it might be a more efficient way to excite many cells in a fixed time window than the scanning techniques presented here. Thank you for the comments. We note that maximizing the total number of neurons activatable is a key thrust of this paper, but it is not the only one. Full, independent but simultaneous 3D targeting is another critical contribution. With regards to this concern, please see the response to comment 1. For photostimulation duration above 5 ms, the required power for spiral scan is about half compared to scanless approach to evoke similar response in neurons. At 1 ms photostimulation duration, the hybrid approach shows a trend with smaller power budget (but not significant, p=0.17 using one-way ANOVA test) than the scanless approach, for this particular opsin, but at peak intensity levels per cell we are not comfortable with. In this case, a higher laser repetition rate may facilitate the hybrid approach in this extreme time scale, as there would be more effective dwell time per unit area on the cell. Complete optimization of photostimulation at very short time scales is outside the scope of this paper, and we feel that the latencies and low jitter are already very good, and far better than one can “read-out” with calcium imaging. 3) It is nice to see a larger population activated than in the previous version. But what is the reason why so many cells fail to respond? Is it simply that they weren't expressing enough C1V1? This is worth checking via fluorescence of mCherry and discussing in the text. In our experiments, we do not find a clear correlation between mCherry expression and the excitability of C1V1. This is consistent with the result reported in Packer et al., (2015). There are cells that expressing mCherry but do not appear to respond to single cell photostimulation. We do not see a specific correlation between the depth and the excitability. In Figure 4, where photostimulation on large neuronal population is shown, we note that cells that could be photoactivated when the target ensemble is small may not get photoactivated when the size of the targeted ensemble increases. We have no direct measurements, but we suspect that when large number of pyramidal cells are targeted, they subsequently also activate interneurons, which could in return suppress these pyramidal cells. We have noted also a similar effect in brain slices. This network interaction is the subject of a future study. 4) Regarding Figure 1—figure supplement 4. There appears to be some activation from scanning at 90mw relative to 0mw. A t-test should give a p-value around 0.05. The text should address this. We added this t-test value in the figure caption. 5) There are several relatively straightforward analysis steps that the authors should take to address the concerns regarding why cells that fail to respond during ensemble stimulation. Can the cells that fail to respond during ensemble stimulation be stimulated by themselves or are they just not excitable? This is related to comment 3. 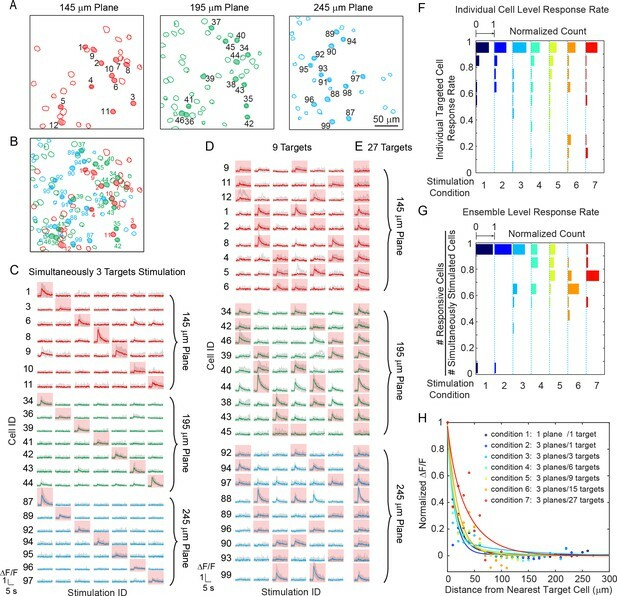 In the large ensemble stimulation, we did not specifically perform single-cell photostimulation on each individual target cell. If cells fail to respond under any of the tested photostimulation patterns, we classified them as “cells never respond”, which is stated in the main text as well as in Materials and methods section. This could be the lack of C1V1 expression. As in the response in comment 3, we do see that cells that could be photoactivated when the target ensemble is small may not get photoactivated when the size of the target ensemble increases. It is possible that when large number of pyramidal cells are targeted, they could also activate interneurons, which could in return suppress these pyramidal cells. This network dynamics is deserved for a future study and is beyond the scope of this paper. This work was supported by the NEI (DP1EY024503, R01EY011787, R21EY027592), NIMH (R01MH101218, R01MH100561, R41MH100895, R44MH109187), and DARPA contracts W91NF-14-1-0269 and N66001-15-C-4032. This material is based upon work supported by, or in part by, the U.S. Army Research Laboratory and the U.S. Army Research Office under contract number W911NF-12-1-0594 (MURI). W Yang holds a career award at the scientific interface from Burroughs Wellcome Fund. Y Bando holds a fellowship from Uehara Memorial Foundation. The authors thank Reka Letso, Mari Bando, and Azi Hamzehei for virus injection of the mice; Jae-eun Kang Miller for mice preparation; Sean Quirin for the initial software for SLM control; Adam Packer and Alan Mardinly for fruitful discussions. Animal experimentation: This study was performed in strict accordance with the recommendations in the Guide for the Care and Use of Laboratory Animals of the National Institutes of Health. All of the animals were handled according to approved institutional animal care and use committee (IACUC) protocols of Columbia University [protocol ID: AC-AAAM5100, AC-AAAM7951].